Father Robert E. Mazzola, a retired priest of the Archdiocese of Indianapolis, died on Dec. 14 at his home in Connersville. He was 80. The Mass of Christian Burial will be celebrated at 11 a.m. on Dec. 22 at St. Gabriel Church, 232 W. Ninth St., in Connersville. 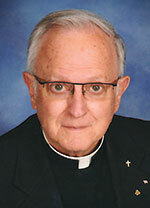 The principal celebrant of the Mass will be Archbishop Charles C. Thompson. Msgr. Frederick Easton, a cousin of Father Mazzola and a retired archdiocesan priest, will be the homilist. Burial will follow at Dale Cemetery in Connersville. The two priests attended the beatification of Pope John XXIII in 2000, Msgr. Easton noted, and Father Mazzola also attended the pope’s canonization Mass at the Vatican in 2014. Msgr. Easton remembers as a boy visiting his grandparents’ home in Bloomington, and seeing his cousin’s growing interest in becoming a priest. Robert Easton Mazzola was born on May 26, 1937, in Bloomington to Arthur and Elizabeth Mazzola. He grew up first as a member of St. Charles Borromeo Parish in Bloomington and later as a member of St. Gabriel Parish in Connersville. He received priestly formation as an archdiocesan seminarian in St. Meinrad at the former Saint Meinrad High School, the former Saint Meinrad College (earning a bachelor’s degree in French literature) and at Saint Meinrad Seminary and School of Theology. He earned a bachelor’s degree in sacred theology from the Catholic University of America in Washington. Father Mazzola was ordained a priest on May 5, 1963, at the Archabbey Church of Our Lady of Einsiedeln by Archbishop Paul C. Schulte. His first pastoral assignment was as associate pastor of the former St. Francis de Sales Parish and as part-time instructor at Father Thomas Scecina Memorial High School, both in Indianapolis, from 1963-64. In 1964, he temporarily served as associate pastor of St. Mary Parish and St. Michael Parish, both in Madison. Father Mazzola then ministered as associate pastor of St. Michael Parish in Charlestown and St. Francis Xavier Parish in Henryville from 1964-69; as associate pastor of St. Gabriel Parish in Connersville from 1969-73; and as associate pastor of the former St. Andrew Parish in Richmond from 1973-74. Father Mazzola served as pastor of St. Rose of Lima Parish in Franklin from 1974-83; as pastor of St. Andrew Parish in Richmond from 1983-93; as pastor of Holy Family Parish, St. Andrew Parish and St. Mary Parish, all in Richmond, from 1993-94; and as pastor of St. Michael Parish in Greenfield from 1995-97. Beginning in 1998, Father Mazzola served as an auditor and assistant in the archdiocesan Metropolitan Tribunal in Indianapolis until his retirement in 2011. He is survived by sisters Linda Struewing of Connersville and Margaret Vanderheide of Gallatin, Tenn.